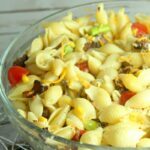 Easy and delicious Cowboy Pasta Salad is a great recipe to try when you are tired of the traditional pasta dishes. It is full of flavor with bacon, ground beef, cheese, Worcestershire sauce and hot sauce. 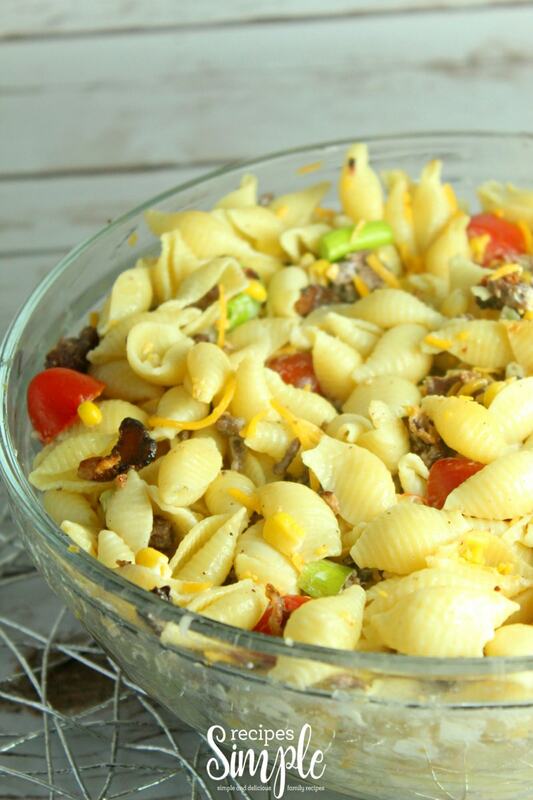 This Cowboy Pasta Salad is a great recipe that I like to take to all our family events. It’s always popular and there are never any leftovers to bring home. It’s perfect for summer parties, church socials and holiday celebrations. One great thing about this recipes is that it is so versatile. You can make it how your family likes it. You can leave out the onions if they don’t like them. You can change it up by adding in red or green peppers, cucumbers, zucchini, black olives, or mushrooms. Instead of sharp cheddar cheese you could use shredded Pepper Jack cheese or Colby Jack. This usually disappears quickly at our house but if you have any leftovers they are great for lunch the next day. 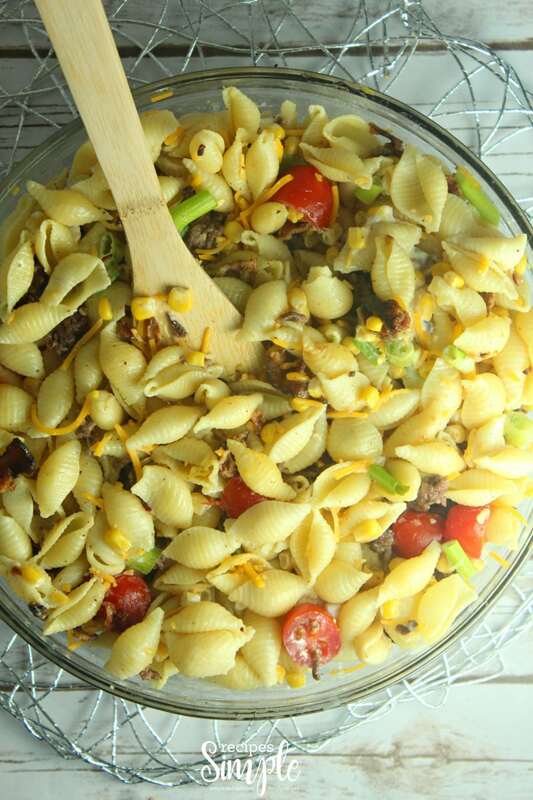 Scroll to the bottom for printable Cowboy Pasta Salad recipe. Gather your ingredients so you’ll have everything on hand before starting. Cook pasta according to package directions and set aside. Saute bacon in a large pan until crispy then put on a plate; set aside. Next cook the ground beef until cooked through. Drain fat and set aside. Season with the cumin and red pepper flakes. In a very large bowl, whisk together mayonnaise, barbecue sauce, mustard, Worcestershire sauce, and hot chili sauce until combined. 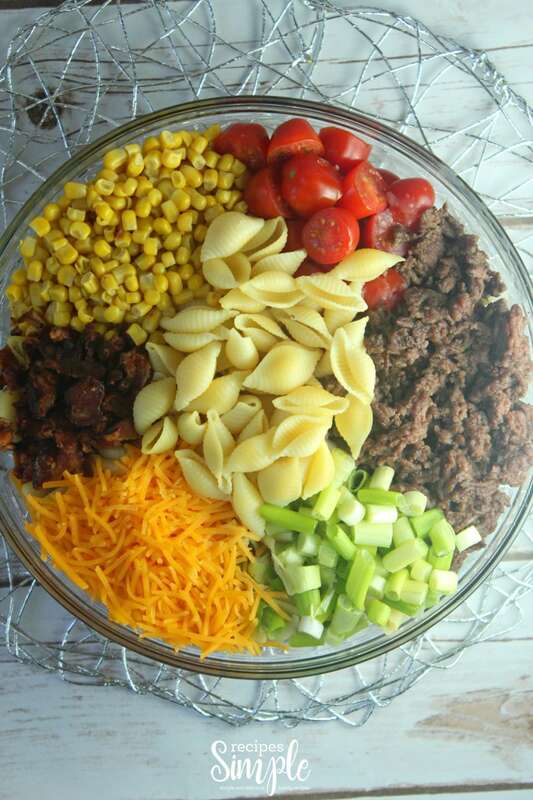 Add in the cooked pasta, bacon, beef, corn, tomatoes, cheese, and onions. Stir and serve immediately. 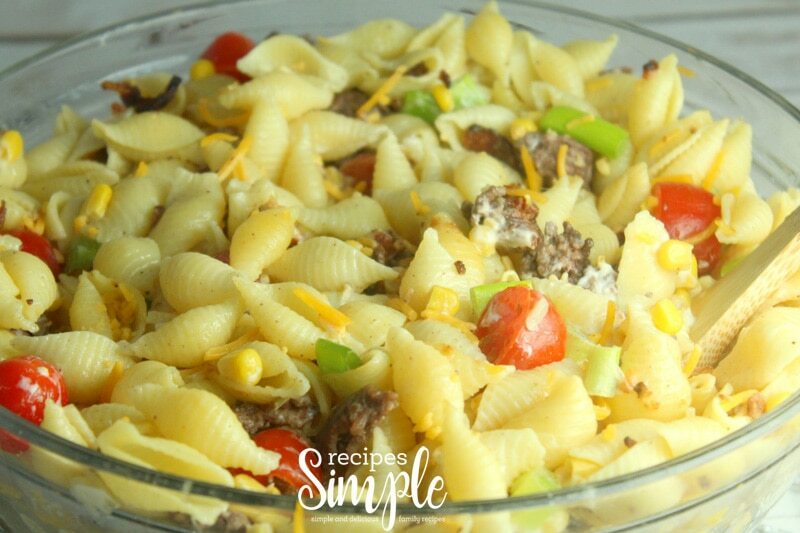 This easy and delicious Cowboy Pasta Salad is full of flavor with bacon, ground beef, cheese, Worcestershire sauce and hot sauce. Saute bacon in a large pan until crispy then put on a plate; set aside. Cook ground beef until cooked through. Drain fat and set aside. Season with the cumin and red pepper flakes. Add in the cooked pasta, bacon, beef, corn, tomatoes, cheese, and onions. Stir to mix well and serve immediately.